Marg and I just spent a glorious three days in one of my favourite places on earth—Cathedral Lakes. Nestled in the Okanagan Range of the North Cascade Mountains, these lakes are the jewels in a spectacular landscape. We were invited up there by a group of local school teachers who had come up with the ideal professional development idea—get inspired by soaking up the natural grandeur of the mountains, learning about geology, ecology and conservation. We stayed at the Cathedral Lakes Lodge, located near treeline on the shores of Quiniscoe Lake. It’s hard to beat the idea of hiking in the alpine all day and coming home to a hot shower and great food! I’ve camped at Cathedral many times, but must admit the Lodge is always tempting. You can hike up to the lakes, but it’s a long, steep, dry 15-kilometre walk, so I’ve always taken the Lodge taxi service up. The drive is an adventure in itself, perched in the back of a Unimog as you climb up some pretty hairy mountainsides. You start in the hot pine-fir forests of the Ashnola Valley, and an hour later you’re at the lodge, with cool mountain breezes coming off the lake and late summer snowfields. 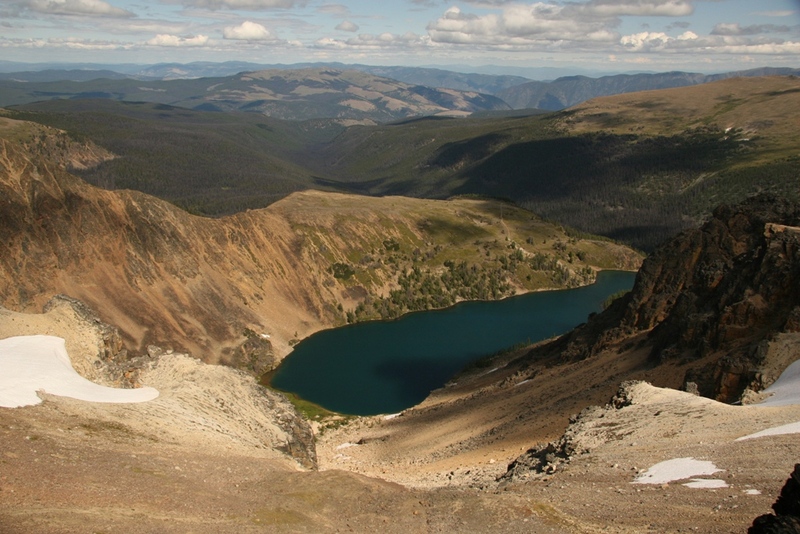 Cathedral Lakes is one of the finest places in British Columbia for mountain birding as well. Clark’s Nutcrackers are common around the Lodge, and Spruce Grouse are easily found in the subalpine forests nearby. Many trails climb up the cirque walls past rock bluffs and snowfields, where Gray-crowned Rosy-Finches are often seen. We took our first walk along the trail to Ladyslipper Lake. It begins in spruce forest that has been heavily impacted by a spruce beetle outbreak for the past five years or so. American Three-toed Woodpecker numbers soared after the beetles arrived, but now most of the large trees are long dead and we only heard one woodpecker calling. Younger trees are still common though, so the forest is very functional, and was full of mixed species flocks. A group of chickadees—both Mountain and Boreal—moved through the trees while juncos flew up from the grouseberry. What was very noticeable were the flowers—the subalpine meadows were spectacular with lupines, daisies, arnica and paintbrush. Normally this bloom wave occurs in late July, but this year it was obviously 5 weeks late because of late, deep snowfalls and a cool start to summer. The snowpatch at the top of the trail—often melted by early August—was still large, it’s melting edge swarming with yellow springtails. As we reached the ridgetop, a Prairie Falcon rocketed by, probably on the lookout for Columbian groundsquirrels. A pair likely breeds on the cliffs of Crater Mountain, a few miles north, but this is still a very rare bird in British Columbia. The next morning we took the trail to Glacier Lake, climbing the ridge where the movie “Clan of the Cave Bear”was filmed. I remember sending a couple of Californian birders up to the Cathedrals that summer to look for Spruce Grouse—I don’t know if they saw any, but they were certainly surprised to encounter a Neanderthal on the trail. Unaware of the movie shoot, they were dumbfounded by the sight, and even more surprised when the caveman calmly asked them how far the lodge was. We did see a Spruce Grouse on the trail—a female with a single small young. 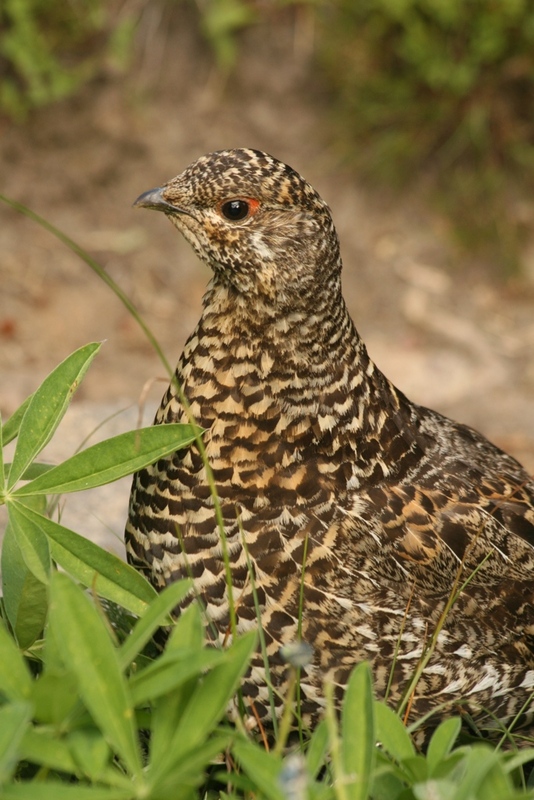 These grouse are often called “Franklin’s Grouse”, since they differ markedly from the eastern Spruce Grouse by lacking the reddish-brown tip to the black tail. The males also have a different display, one in which they flutter down from a tree branch and loudly clap their wings together over their back. The resulting double-clap is quite startling when heard on an early morning hike in the mountains. The open slopes below the lake are carpeted in juniper bushes, full of grey-blue berries. Not surprisingly there was a Townsend’s Solitaire at the meadow edge, guarding its juniper patch. Another (or was it the same?) Prairie Falcon flew overhead, heading for Ladyslipper Lake, its crop full. We climbed beyond Glacier Lake to the cirque wall beyond. A couple of American Pipits fed in the steeply falling brook that came out of the snowfields above, but we didn’t see any Rosy Finches around the snowfields. They specialize in eating insects that become marooned on the cold snow while flying over mountain ridges on warm summer days. A couple of pikas gave their nasal enk! calls, scampering away with mouthfuls of hay. Once on the ridge we enjoyed the view of the North Cascades, from Glacier Peak in the south to the alpine ridges of Manning Park to the west. A big flock of Horned Larks twittered by, then dropped onto the tundra to forage in the grass. We walked south to the remarkable rock formations of Stone City, a collection of rounded quartz monzonite boulders the size of small houses. This ridgetop was not scoured by the continental glaciers that flowed south out of the Columbia and Rocky Mountains during the Pleistocene. 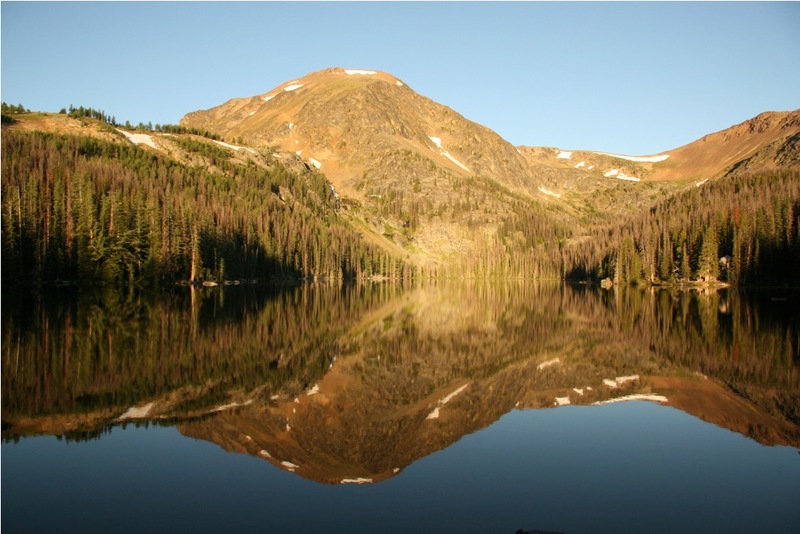 The northeast side of the ridge was scooped out by a series of alpine glaciers, however, creating the cirque valleys that now hold Quiniscoe, Glacier, Pyramid and Ladyslipper Lakes. 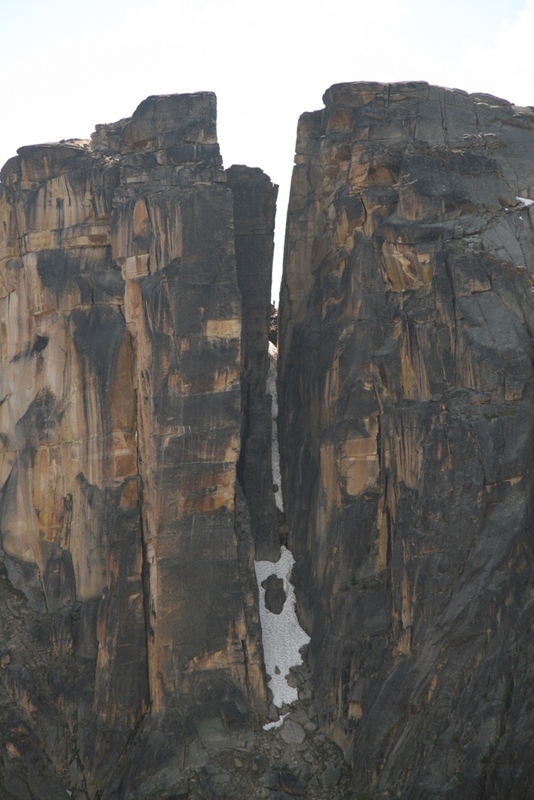 Some of the group continued on from Stone City to explore Smokey the Bear and the Giant Cleft, rock formations in the huge wall that forms the south end of the ridge as it turns east to Goat Lake and Boxcar Mountain. Marg and I led separate groups back down into the valley. I took the steep scrambly route down to Ladyslipper Lake that goes through a magical meadow dotted with huge boulders. In the lee of each boulder huddled a stunted alpine larch. I’d expected to encounter a herd of mountain goats here, but they had obviously slipped behind some rock formation and we never did see them. Dawn on the following day was beautifully calm, Quiniscoe Lake a mirror for the orange tints of Quiniscoe Mountain, a glittering layer of late summer frost on the rustic dock in front of the lodge. We took a short walk to tiny Scout Lake that morning, finding a snowshoe hare feeding on grouseberry along the way. Some of the group took the long way back over Red Mountain, but after yesterday’s long hike, most of us were content to amble through the valley meadows and forests. The gang was quieter on the way down, tired but recharged with stories of adventure they can tell to their classes this fall. What a gorgeous place! Great shot of the grouse.